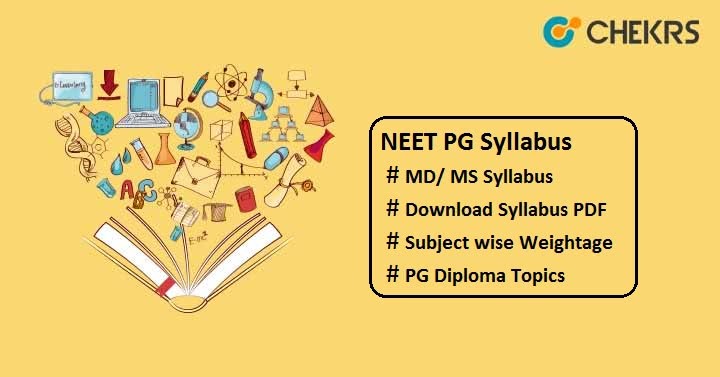 NEET PG 2019 Syllabus Pdf Download: Candidates who are aiming to pursue MD/ MS and PG Diploma medical courses from various participating institutes can apply for NEET PG. Now if you already applied, you are at the right place, because here you will get every single detail for the best preparation. NEET PG Syllabus is prescribed by Medical Council of India (MCI). It comprises of subjects of MBBS & BDS such as Para-clinical, Pre-clinical, Clinical etc. For better exam preparation you should go through the official syllabus. Check the important topics that are important from the exam point of view and score well. The Thorax, The Abdomen, The Pelvis, The Perineum, The Upper Limb, The Lower Limb, The Head and Neck, The Back, Miscellaneous Topics. Genetic and Pediatric Diseases, Environmental and Nutritional Diseases, General Pathology of Infectious Diseases, The Blood Vessels, The Heart , Hematopoietic and Lymphoid systems, Lung, Kidney and its collecting system. Cell injury, Cell death and adaptations, Acute and Chronic inflammation, Tissue Repair, Regeneration, Healing and Fibrosis, Hemodynamic Disorders, Thrombosis and shock, Diseases of the Immune system Neoplasia. Drugs Acting on Central Nervous System, Cardiovascular Drugs, Drugs Acting on kidney, Drugs Affecting Blood and Blood formation, Gastrointestinal Drugs, Antimicrobial Drugs, Chemotherapy of Neoplastic Diseases, Miscellaneous Drugs. Biological cell, Biomolecules, Enzymes, Metabolic pathways, their regulation and metabolic interrelationships, Carbohydrate metabolism, metabolism of Amino acid, Lipid, TCA cycle and biological oxidation, Proteinoids. Diseases of Ear, Diseases of Nose and Paranasal Sinuses, Diseases of oral cavity and salivary Glands, Diseases of pharynx, Diseases of Larynx and trachea. Gastrointestinal Surgery, Urogenital Surgery, Paediatric Surgery, Hernia, Umbilicus and Abdominal wall Cardiothoracic Surgery. Infectious diseases, tropical medicine and sexually transmitted diseases, Cell and molecular biology and genetic disorders, Clinical immunology, Nutrition, Gastrointestinal disease, Liver. Biliary Tract and Pancreatic Disease, Haematological disease, Medical oncology including Haematological malignancy, Rheumatology and bone disease, Renal disease, Water Electrolyte and Acid Base Balance, Cardiovascular disease. Diseases & Injury to female genital tract, Conception, Birth control and MTP, Trophoblastic diseases, Ectopic gestation and disorders of menstruation. Tumors and its therapy, PID, Chronic pelvic pain, Endometriosis, Miscellaneous Topics. Common clinical disorders, Drug Therapeutics, diagnostic and investigative procedures. Disorders of Pigmentation, Allergic disorders, Papulosquamous disorders, Papule vesicular disorders. Leprosy, Fungal infections, Scabies, Pediculosis, STD, Malignant Skin disease. Candidates must check Subject wise Weightage to know which subject carries more weightage. With the proper analysis of exam syllabus and paper pattern, you can make a proper strategy to complete entire syllabus in less time and then start revising them. We recommend you to practice Previous Year Papers to solve the questions on daily basis and analyze your knowledge. It will be helpful to improve your speed & accuracy. National Board Examination (NBE) is responsible for organizing this exam every year. To get admission in the colleges of your choice, it is compulsory to qualify the exam with maximum marks. Now you must be looking for complete syllabus. So don’t worry follow the above provided NEET PG Entrance Exam Syllabus and exam pattern and try your best.